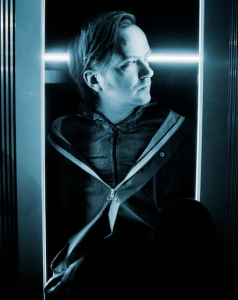 From the Northern edge of Europe comes a child of the plastic age, Jori Hulkkonen (born 1973) also known under several pseudonyms as Avalon Unbounded, Bobby Forester, Deks Dekster, Electromantic, Eternal Boyman, Hösh!, J.A.W.S., Jii Hoo, Jori Juhanna, Midnite City Soul Affair, Vichy, Zyntherius, Third Culture, Sin Cos Tan and many more. With releases in the last two decades exploring 360 degrees on the musical radar, he’s been hailed by DJ Mag as “the most underrated producer in the world” or in Canadian Tiga’s opinion “living legend of electronic composition” and “music’s best kept secret”. Raised up around the Arctic Circle, below freezing point and under the influence of a cocktail of synth-pop and early electro, house and techno broadcasted by Swedish radio, Hulkkonen quickly developed a taste, and more importantly, a passion for electronic music. With no musical education or background in playing any instruments, he started to experiment with electronics in 1988 and soon founded his own label Lumi Records with likeminded friends. He released his debut 12 inch in 1993, continuing with raw jacking Chicago House oriented tracks on labels such as the Italian ACV and Swedish Cari Lekebusch’s Hybrid, before signing an artist contract with Laurent Garnier’s legendary F communications imprint and releasing his debut album “Selkäsaari Tracks” in 1996. Since then, he released ten artist albums for F Communications and more recently Turbo Recordings, collaborated with people as versatile as John Foxx, José Gonzales, Jesper Dahlbäck (as Kebacid) and Phonogenic (as Discemi) and many more productions on some of the world’s leading house and electro labels. Hulkkonen is also sought-after remixer with close to a hundred remixes for artists as diverse as Chromeo, Kid Cudi, Robyn, and Lydia Lunch as well as producing albums for the bands Sister Flo, Villa Nah and NightSatan and the writing/production work on both albums of Tiga, qualifying him as a passionate music aficionado. Hulkkonen’s biggest international success was in 2001 under his pseudonym Zyntherius together with Tiga with their version of Corey Hart’s 80s hit “Sunglasses At Night” on DJ Hell’s Gigolo imprint resulting in quarter of a million sold items, including a Top Of The Pops performance. Aside from the more traditional DJ/producer work, Hulkkonen has raised some eyebrows by assembling the Acid Symphony Orchestra in recent years, an experimental avant-garde techno ensemble of eleven persons, featuring ten Roland TB-303’s, performing a raw score written, conducted and mixed by Hulkkonnen. In 2009, the project received accolade by Ralf Hütter after the Orchestra was the opening act for genre-defining Kraftwerk. It’s a pleasure to have such a versatile DJ and producer as a guest in Istanbul. See you on the 34th floor. Tracking Imprints: Lack REC. (Berlin)!